Hey guys Jerm here and I just wanted to share some World Cup Soccer news in the form of a funny video that I found on YouTube. I think we really have hit FIFA World Cup fever in this country when the guys over at BlendTec get in on things! Many of you may or may not have seen the "Will It Blend" YouTube videos where the Blendtec folks will take anything and drop it into one of their high powered blenders just so show how high quality and powerful their product is. I have seen these guys blend everything from marbles, to video cameras, a skis, and as much as it pained me to watch, an Apple IPad! 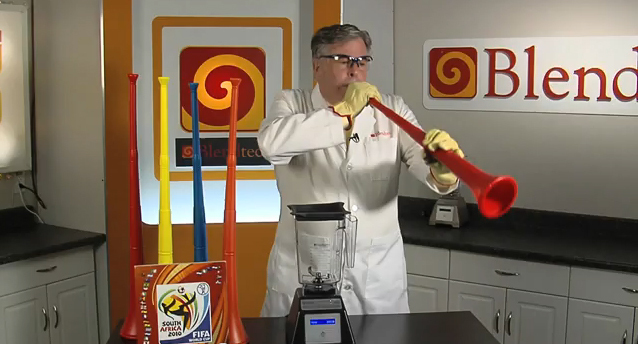 Well given all the hoo-hah we have been hearing from disgruntled fans about the Vuvuzela, the musical instrument on display at this years FIFA World Cup in South Africa, the gang over at BlendTec decided to test out there famous theory of "Will It Blend!" I won&apos;t spoil the surprise for you, as far as telling you whether it will blend or not, so you will just have to watch the video and find that out for yourself! Now me personally, I actually love the Vuvuzela, as to me its really been the soundtrack for this installment of the FIFA World Cup, and adds a level of rhythm to the play on the field. One thing I don&apos;t want you to wait for though is signing the petition to help bring the 2018 FIFA World Cup to the United States or the 2022 FIFA World Cup to Tampa especially! So be sure to log onto www.GoUSABid.com/Tampa, and show your support for the World Cup United States bid!